Michael Richards was kinda weird even before all hell broke loose. Note to readers: Caught between Seinfeld and a post-Kramer flop, Michael Richards acted decidedly loopy during this surprise appearance at an NBC party. As the semi-annual network TV "press tour" prepares to start its engines on Monday (July 9th) in L.A., here's a look at my close encounter with Richards before his now infamous comedy club tirade cast him in an entirely new light. This article originally appeared on Jan. 15, 2002 during the heart of that year's midseason press tour. HOLLYWOOD -- Michael Richards has spent the last year wondering what hit him. In fact, there may still be a few bells ringing upstairs. "Can I see your tape recorder? he asks. "Is it a nice one? Because I wanna get one." Our venue is the Garden of Eden club, where NBC recently kicked off its 75th anniversary with a reception for stars past and present. Richards, a surprise attendee, has walled himself off in a corner booth, suggesting a desire to be seen rather than heard by the press. And he's quite a sight in a multicolored faux-velvet jacket and a light green tie decorated with lush red lips. Even in darkened surroundings, the ensemble looks bold and bright enough to eclipse the loudest dressers in the land, even Paul Shaffer. "The tie is a fashion statement by the Italian designer Fornicetti," Richards says after a few reporters are allowed to slide into his domain. "The jacket I think is from some Halloween house in North Hollywood. I really don't know." 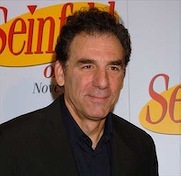 Enshrined as Cosmo Kramer on Seinfeld, Richards lapsed into a career coma after last season's The Michael Richards Show collapsed in a heap on NBC. His portrayal of bumbling Los Angeles private eye Vic Nardozza marked the first post-Seinfeld venture by a member of the show's storied Big Four. Jason Alexander since has tried and failed on a similarly grand scale with ABC's Bob Patterson sitcom. A third Seinfeld alumna, Julia Louis-Dreyfus, will tempt fate next month in NBC's new Watching Elle series. "She lives down the street from me, and the lights aren't on," Richards says. "So they must be at the studio all night long getting this one up for America." He then breaks loudly into a country song. "Yippie ki yo ki yay, yippie ki yay . . . "
But seriously, folks, Richards, 52, is just now returning to the living. "I tell ya, my spirit was broken a bit there," he says. "I don't like to come out in the open and try to do something for an audience, and then it doesn't work. That's a blow to any performer. The lights went out, and it was really tough." 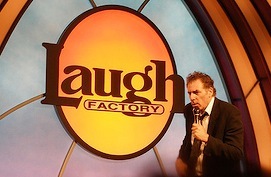 Still, the quick demise of The Michael Richards Show couldn't have come sooner, he says. Asked what went wrong, he says, "Probably it was my interest. "I got three shows made and said, 'I don't want to do this.' I felt that the concept wasn't right. I knew in the beginning we were headed in the wrong direction. I don't drink, but I wanted to have a bottle of liquor after that one to celebrate getting freed of the process. "When I would come to work, I was probably more vocal about the show's problems than the critics were. Since then, I haven't done anything for an entire year, really." He's now hoping to resurface on his own terms. For starters he's been dropping in at comedy clubs and "just getting in front of an audience and loosening up a little bit. It's more of a social thing for me than a professional obligation. I'm just kind of talking about what I see around me." Richards also wants to spend some of his Seinfeld fortune "putting together a company of my own." He'd be its initial star attraction. "I want to shoot comedy out in the open, in the streets and about the town. I want to work in that manner. It would be the real me and real people and real circumstances, and me putting myself into them. I'd have a small TV crew following me around." He hopes to emulate Seinfeld co-creator Larry David, who's "just doing what he thinks is funny right now" as the star of HBO's increasingly popular Curb Your Enthusiasm. "Larry doesn't sit around and try to get a psychological understanding of what today's audiences want. Ultimately, good comics take the audience to their level. And that's how popularity, trends and fashion arise." It took two years, he notes, for Seinfeld to find an audience. "Today a show like that never would make it because people are spooked. It's costly to make these TV shows, and people want to see a (financial) return quickly." He's cool to any Seinfeld reunion show, at least for now. "Oh, I don't know," he says. "Do you really want that?" Probably it's way too soon. Let's get all this other stuff out of their systems first.